Dumbledore was portrayed by Richard Harris in the film adaptations of Harry Potter and the Philosopher's Stone (known as Harry Potter and the Sorcerer's Stone in the USA) and Harry Potter and the Chamber of Secrets. After Harris' death, Michael Gambon portrayed Dumbledore for all of the remaining Harry Potter films. Jude Law portrayed Dumbledore in the prequel film Fantastic Beasts: The Crimes of Grindelwald. Rowling stated she chose the name Dumbledore, which is a dialectal word for "bumblebee", because of Dumbledore's love of music: she imagined him walking around "humming to himself a lot". In the fourth novel, Dumbledore introduces the Triwizard Tournament. He also serves as a judge during the entire event. When Harry's name comes out of the Goblet of Fire, Dumbledore is not enraged, but remains calm; simply asking Harry whether he had himself, or had asked an older student to submit his name (although in the film version he does get angry to the point of manhandling Harry). When Harry answers no, he believes him. By the end of the book, Dumbledore's fears are realized when Harry returns from his encounter with Voldemort clutching the dead body of Cedric Diggory and when Mad-Eye Moody (being impersonated by Barty Crouch Jr, through Polyjuice Potion) takes Harry away from Dumbledore and to his office inside the castle. Dumbledore immediately becomes suspicious and heads straight towards Moody's office with Minerva McGonagall and Severus Snape to save Harry and to interrogate Crouch. Afterwards, Dumbledore listens to Harry's eyewitness account about Voldemort's return. Harry though, only wakes up later to find Minister for Magic Cornelius Fudge in the hospital wing arguing with McGonagall and Dumbledore. In the end, Fudge and Dumbledore "part ways" after an argument about the situation of Voldemort's return and the consequences that would follow should Fudge remain in denial of this fact. Dumbledore is not heard of again in the book until he arrives in the Department of Mysteries to aid the Order in the battle against the Death Eaters. He subdues all the Death Eaters, except for Bellatrix Lestrange, and binds them with an Anti-Disapparition Jinx to prevent them from magically escaping. He then saves Harry from the Avada Kedavra curse conjured by Voldemort and engages in a ferocious duel with the Dark Lord. This culminates in Voldemort's attempting to possess Harry in an attempt to make Dumbledore kill the boy. Voldemort is forced to leave Harry's body and flee with Bellatrix after this ruse fails. Many ministry officials having witnessed the end of the battle, Dumbledore is reinstated as headmaster and retrieves all his distinctions. Towards the end of the book, Dumbledore explains to Harry that Voldemort chose him as his equal and that one must kill the other in the end, and confesses that his great affection for Harry has clouded his judgement. It is learned that Voldemort created six Horcruxes to gain immortality and that they must all be destroyed before Harry goes after the final piece of Voldemort's soul in the Dark Lord's body. Harry also repeatedly warns Dumbledore in most of their lessons that Draco Malfoy is working for Voldemort. Dumbledore refuses to take any action against Draco, and instead tells Harry that he already knows more about what is happening than Harry does. By the end of the book, Dumbledore and Harry set out to the cave where Dumbledore believes a Horcrux resides. In the cave, Dumbledore drinks a potion inside the Horcrux's container; while drinking it, he begins to scream, seemingly enduring mental torture and being weakened. Dumbledore begins to call out for water after he finishes the potion, and Harry, realising he has no other choice, dips the goblet into the lake to give him a drink. When he does this though, all the Inferi that reside in the lake grab at Harry and attempt to drag him down and drown him in the lake. Dumbledore suddenly recovers, thanks to the water, and conjures a fire lasso around them. Dumbledore takes the horcrux (a locket) and both make their way back out of the cave and back to Hogsmeade. When they return, Madam Rosmerta informs them that the Dark Mark was conjured over the Astronomy Tower. In the tower, Dumbledore enjoins Harry not to interfere in the events that are about to take place there, and places him in a body-binding curse under his invisibility cloak. Hidden, Harry is unable to intervene as Dumbledore (now extremely weak) is disarmed by Draco. Dumbledore is conversing with Draco about the plot to kill him, when several other Death Eaters enter the tower and try to persuade Draco to kill Dumbledore. When Draco hesitates, Snape appears and performs the Killing Curse on Dumbledore, only after Dumbledore pleads with Snape saying, "Severus, please ...". To what Dumbledore was referring is not revealed until the seventh book. Dumbledore dies on Hogwarts' grounds. Rowling used several chapters in Harry Potter and the Deathly Hallows to reveal two major details concerning Dumbledore: his early life and his death. The book introduces his parents, Percival and Kendra Dumbledore, as well as his little sister, Ariana; his brother, Aberforth Dumbledore, was mentioned in previous books. At six years old, Ariana was attacked by three Muggle boys who had witnessed her doing magic. Because of this attack, Ariana was seriously traumatised and never able to control her magic again, having recurring outbursts of magic. Enraged, Percival mercilessly attacked the Muggle boys (killing them in the film version), and was given a life sentence in Azkaban. After this, Kendra moved her family to the village of Godric's Hollow. In one of her outbursts, Ariana accidentally killed Kendra at around the time that Albus completed his education. Albus became the head of the family and was forced to remain in his house with his sister while Aberforth completed his education. Soon afterward, a young Gellert Grindelwald arrived in Godric's Hollow to live with his great-aunt, Bathilda Bagshot, author of A History of Magic. The two young men took to each other immediately, and together they dreamed of a world ruled by wizards over Muggles by uniting the legendary Deathly Hallows. They believed that if they were forced to destroy a few along the way, it would still be "for the greater good", and the sufferings and losses would be rewarded a hundredfold in the end. However, this scenario would never happen, as an argument between Albus, Aberforth, and Grindelwald led to a duel that resulted in Ariana's death. For the rest of his life, Albus felt guilty, never certain whether it was his own curse or another's that had killed his sister. Grindelwald stormed back to Bagshot's home and departed to begin his own rule, leaving the country hours later. As a result of his mistakes, Albus felt that he was not to be trusted with power and, because of this, never took the position of Minister for Magic, despite being offered it several times. Dumbledore returned to Hogwarts as professor of Transfiguration, and he served in recruiting students for the school. Decades later, in 1945, Dumbledore finally defeated the now-Dark wizard Grindelwald, who had come to possess the Elder Wand. Grindelwald's defeat made Dumbledore the master of the Elder Wand, which remained his until just before his death, when Draco used the Disarming Charm on him. Dumbledore's spirit appears to Harry towards the end of the book in a limbo-like King's Cross, after Harry is struck with the Killing Curse which was conjured by Voldemort. During the last book, Harry finds out that he must die because he is a Horcrux. When Voldemort conjures the Killing Curse, Harry does not fight back, which stops him from dying. When they meet again, the boy comforts Dumbledore as he confesses all of his many regrets. Dumbledore then informs Harry of the choice he still has: of moving on to the next life or returning to his body to face Voldemort one last time. After returning from the mystical King's Cross and defeating Voldemort for good, Harry has a short conversation with Dumbledore's portrait in the Headmaster's office about the fate of each of the three Deathly Hallows. He keeps the Cloak, leaves the Stone in the Forbidden Forest where he dropped it, and returns the Elder Wand to Dumbledore's tomb (from which Voldemort had stolen it). In the epilogue, it is revealed that Harry names his second son Albus Severus Potter after Dumbledore and Snape. In the film adaptations of Philosopher's Stone (2001) and Chamber of Secrets (2002), Dumbledore was played by Richard Harris, who was expected to play the character throughout the series. Harris mentioned that he was originally not going to take the role, since he knew his own health was in decline. He accepted because his then-11-year-old granddaughter threatened never to speak to him again if he did not take it. Harris was determined to portray Dumbledore again in Prisoner of Azkaban (2004), despite having been diagnosed with Hodgkin's lymphoma, and asked David Heyman not to recast the role. However, his death on 25 October 2002 necessitated recasting. Ian McKellen was offered the role, but he turned it down, having played the similar character Gandalf in The Lord of the Rings trilogy, as well as feeling it would have been inappropriate to take Harris's role, as Harris had called McKellen a "dreadful" actor. Harris's family had expressed an interest in seeing Peter O'Toole being chosen as his replacement. Michael Gambon was cast as Harris's replacement four months after Harris's death. Gambon was not concerned about bettering Harris, and he portrayed the character in his own way, putting on a slight Irish accent for the role, as well as completing his scenes in three weeks. Gambon reprised his role in all the remaining films. Toby Regbo was chosen to portray Dumbledore in his youth in Deathly Hallows Part 1 and Part 2, for flashbacks scenes which provide essential information on the character's backstory. Jude Law played the role of a younger Dumbledore in the second prequel film, Fantastic Beasts: The Crimes of Grindelwald. Albus Dumbledore is tall and thin, with silver hair and beard (auburn in his youth) so long that they can be tucked into his belt. He has a very long and crooked nose that looks as if it has been broken at least twice. (It is speculated that his brother's punch during their sister's funeral may have played a role in shaping his nose.) He is also said to have long and skillful fingers. His eyes are described as being a brilliant, soul-piercing shade of blue, and usually twinkled with kindness and mischief. Dumbledore wears half-moon spectacles and a colourful array of robes, ranging from purple to bright orange. He once claimed to have a scar above his left knee in the precise shape of a map of the London Underground, but whether or not he actually does is unknown. His demeanour is often – if not always – serene and ethereal, and he usually speaks in a calm, pleasant voice even when Harry thought that he is actually furious. During the last year of his life, Dumbledore's right hand is scarred when he dons Marvolo Gaunt's Ring, which was cursed. Had Snape not intervened with a counter-curse, Dumbledore would have died much more quickly. Regardless, the curse left his hand blackened and dead-looking, and no amount of healing could repair the appearance. According to Snape, the curse would eventually spread itself from the contained hand, and Dumbledore was doomed to die in no more than one year's time. Whether this means the blackening dead-look appearance would spread throughout the entire body is unknown. More than anything else, Dumbledore has a deep capacity for love, frequently reminding Harry that love was the greatest magic of all. Dumbledore believes in the good in everyone and insists on giving second chances. The greatest example of this is Dumbledore's relationship with Snape, in whom Dumbledore is willing to place a considerable amount of faith because he showed remorse. Dumbledore is highly perceptive and emotionally intelligent; his knowledge of a person's true personality goes beyond simply being a good judge of character. This is never more apparent than in his complex insights into Voldemort's psyche, which he pieces together with Harry to deduce where Voldemort's horcruxes are hidden. "At that moment, Harry understood for the first time why people said Dumbledore was the only wizard Voldemort had ever feared. The look upon Dumbledore's face was more terrible than Harry could have ever imagined. There was no benign smile upon Dumbledore's face, no twinkle in the eyes. There was cold fury in every line of the ancient face; a sense of power radiated from Dumbledore as though he were giving off burning heat." However, in spite of Dumbledore's many extraordinary qualities, he was a flawed character. According to Rowling, "Although Dumbledore seems to be so benign for six books, he's quite a Machiavellian figure, really. He's been pulling a lot of strings." In a 2005 interview, Rowling commented: "Immense brainpower does not protect you from emotional mistakes, and I think Dumbledore really exemplifies that." Dumbledore's greatest personality flaw, which he explained to Harry, was his desire for power. He eventually found that those best suited for power are those who do not seek it. When he and Grindelwald met each other, they made plans to enslave Muggles and re-establish wizards as the natural rulers of the world. However, Dumbledore was disillusioned of this fantasy after his sister Ariana was killed during a duel between himself, his brother Aberforth, and Grindelwald. His knowledge of the most powerful kind of magic, love, is extensive. He taught Harry about its very essence, and the innate power of his ability to love his parents, which eventually helped Harry realise his destiny to kill Lord Voldemort. He is known to be able to conjure Gubraithian fire (magical everlasting fire). He has claimed to be able to become invisible without using an invisibility cloak, which is a powerful Disillusionment Charm. Dumbledore is also skilled in Occlumency and Legilimency. Dumbledore is an expert at Transfiguration too, having taught the subject before becoming headmaster. He frequently creates complex objects like sofa chairs out of thin air (or from less comfortable chairs). Dumbledore is also proficient at Charms and Potions; according to the obituary written by Elphias Doge, his papers were published in journals such as Achievements in Charming and The Practical Potioneer. 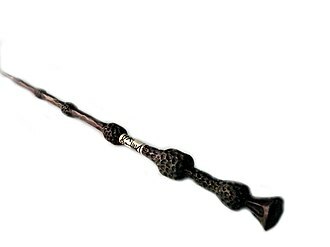 Dumbledore is famous for defeating Grindelwald, who is second on a list of Most Dangerous Dark Wizards of All Time only to Voldemort himself, in a "spectacular duel of legend", succeeding in doing so despite the fact that Grindelwald possessed the Elder Wand, which supposedly guarantees invincibility in duels due to its power. His skill at duelling is further shown when he calmly engages Voldemort in Harry Potter and the Order of the Phoenix, overpowering him and eventually forcing him to possess Harry to be spared from total defeat. (It is known in retrospect that Dumbledore possessed the Elder Wand when duelling Voldemort, having taken it from Grindelwald.) Unlike most wizards who make a distinct popping sound when they apparate, Dumbledore notably is able to apparate silently; the only other wizard shown to possess this skill is Voldemort. Dumbledore is known to be able to understand Mermish and Gobbledegook (Goblin language) and Parseltongue. Through various interviews and discussions about the character, Rowling has established that Albus Dumbledore was born in July or August 1881 to Percival and Kendra Dumbledore. The character had previously referenced his brother Aberforth, and in Harry Potter and the Deathly Hallows, it is revealed that Albus is three years older than Aberforth. The same book established their sister Ariana who, at six years old, suffered a vicious attack by three male Muggle youths who had witnessed her doing magic. Frightened, they first tried to get her to repeat what they had seen, and upon her failure to recreate it due to her young age, they tried to stop her from being "different". The severe trauma of the attack left Ariana unable to function socially or to properly perform magic again. It is not explicitly stated in the novel what form this attack took, but Percival was given a life sentence in Azkaban for tracking down and hexing the boys who traumatised his daughter. To prevent her being institutionalised in St. Mungo's Hospital, or hurting someone accidentally with her uncontrolled magic, Kendra moved the family to Godric's Hollow, and her illness was concealed. Their wizarding neighbours and acquaintances assumed that Ariana was a non-magical squib, and that Kendra was hiding her out of shame. When Dumbledore and his friend Elphias Doge left Hogwarts, they planned to take their "then-traditional" tour of the world. On the eve of their trip, the eighteen-year-old Dumbledore suffered the death of his mother Kendra, who was accidentally killed by Ariana during one of her uncontrolled outbursts of magic. Because Dumbledore's parents were absent (his father in Azkaban and his mother dead), Albus became the head of the family and it became his duty to put food on the table, as they were not left with much gold. He was forced to remain in his house with his sister Ariana while Aberforth completed his education. Aberforth knew of his brother's resentment and offered to care for Ariana himself, claiming that she preferred him to Albus, but Albus refused by stating that it was his duty as the eldest child to care for the family. When Gellert Grindelwald arrived at Godric's Hollow he and Albus became immediate friends, and the two dreamed of a new world order in which wizards ruled over Muggles "for the greater good". Albus and Grindelwald suggested that they had to leave the Dumbledore home to carry on their plans, but Aberforth protested against this as Ariana's condition would not allow her to be moved. The ensuing argument between Albus, Aberforth and Grindelwald turned into a duel, and as Ariana became more and more stimulated, she became caught in the crossfire and was killed - though neither Albus nor Aberforth were sure which out of them and Grindelwald had caused her death. Albus was deeply distressed by this incident, and broke ties with Grindelwald for good. According to the author, as a result of this Albus's boggart became Ariana's corpse. In Philosopher's Stone, he also mentions to Harry that the deepest desire of his heart, revealed by the Mirror of Erised, is to have a pair of woollen socks, but in the seventh novel, Harry realises that he and Dumbledore see the same thing in the Mirror: their reunited families. The character of Albus Dumbledore has been compared to other archetypal "wise old man" characters. Dumbledore acts much like Merlin from The Sword in the Stone, in the manner of an "absent-minded professor"; both Merlin and Dumbledore educate a story's main character in a castle. As writer Evelyn Perry notes, "Dumbledore resembles Merlin both personally and physically; he is an avid lover of books and wisdom who wears flowing robes and a long, white beard." Dumbledore has also been compared with Gandalf from Tolkien's Lord of the Rings. Dave Kopel draws comparisons between Rowling's writing and John Bunyan's The Pilgrim’s Progress and states that, among the Christian symbols that Rowling has used in her books, Dumbledore acts like "the bearded God the Father" figure in which Harry puts his faith to be saved from Voldemort and his servants. IGN also listed Dumbledore as their fifth favourite Harry Potter character, saying that "[f]or a character that was introduced into popular culture a mere twelve years ago, it speaks volumes that Professor Dumbledore has already taken his place among the great mentor figures in literature and film". IGN's Joe Utichi called Dumbledore his third favourite Harry Potter character, calling the revelation that he wasn't so "infallible" one of the most heartbreaking themes of the final book. Actor Michael Gambon received some criticism for his louder, more aggressive, portrayal of the character, who is depicted as exhibiting a more subdued, unflappable calm in the books. This has been attributed to Gambon's policy of not reading the source material from which his films are adapted. Some critics discussed the implications of this statement. The New York Times columnist Edward Rothstein said that "Ms. Rowling may think of Dumbledore as gay"; however, "there is no reason why anyone else should". The East Tennessee State University's student newspaper accused Rowling of lying, saying her answer was a publicity stunt. Michelle Smith quoted the Death of the Author principle, stating that Rowling's subsequent commentary is irrelevant to the understanding of the books. Slate quotes an attendee of the book talk who said, "It was clear that JKR didn't plan to out Dumbledore. She just cares about being true to her readers." Mike Thomas of the Orlando Sentinel said that upon reflection, Dumbledore was gay from the beginning, and that this neatly explains the behaviour of his character and his relationship with Grindelwald. Thomas notes the skill Rowling displays in writing a gay character without having to put a gay label on him. Dumbledore also stars in Neil Cicierega's Potter Puppet Pals, in which he frequently strips completely naked, except for his hat, randomly in the story. Dumbledore also tends to use the exclamation "Alas!" in an apparently incorrect place, parodying Rowling's love for unusual words. In the episode "Ron's Disease", Dumbledore reveals himself to be "a gay android". Albus Dumbledore appears in some episodes of Robot Chicken voiced by Seth Green. In "Password: Swordfish", when the threat of the puberty creature Pubertis is known, Dumbledore gives Harry a stone that might help him fight Pubertis. During this appearance, Dumbledore is an African-American who states that he is played by a different actor in each of the movies. Upon confrontation with Pubertis, Harry rubs the stone two times, which summons ghosts to punch it. When it comes to the third time, Dumbledore appears and tells Harry that the stone can only be warmed up three times a day (four if he takes a week off) and that Pubertis cannot be destroyed since it lives in everyone just like his own demon Wandus Limpus prevents him from having meaningful relationships. In "I Love Her", Dumbledore tells the students that Professor Snape suffered a "minor potion accident" and has enlisted Criss Angel as their substitute teacher. Dumbledore appears in an episode of Icons of Teen from the YouTube channel, Shut Up! Cartoons voiced by Justin Roiland. As a teenager, Dumbledore liked to do magic and make robotic copies of himself. One day, he went scuba diving to earn his scuba diving badge for scouts. Dumbledore gets scared and stays on the boat while his crush Charlene and the scoutmaster go diving. They run into a giant sea monster and Charlene closes her eyes and says Dumbledore, a trick he taught her. Dumbledore receives her distress signal and dives in after them. He meets a talking dolphin who agrees to help Dumbledore if he can eat him in the end. Dumbledore suggests he eat the scoutmaster and the dolphin takes him to his friends. Dumbledore makes a robotic copy and sends it into the creature's stomach, distracting the creature long enough for Dumbledore, Charlene and the scoutmaster to escape. Charlene thanks Dumbledore for saving them. Dumbledore makes a sexual comment but plays it off like she said it. Charlene asks where the scoutmaster is; Dumbledore says he's gone somewhere, when really the dolphin ate him. Dumbledore then decides to build a robot copy of the scoutmaster to prevent anyone from finding out what happened to him. Albus Dumbledore appears in The Lego Movie, though his voice actor is not credited. He is seen among the Master Builders who meet with Vitruvius in Cloud Cuckoo Land, including a Lego version of Gandalf from The Lord of the Rings. ^ Hirsch, Anne-Christin (2008). Names and Their Underlying Mythology in J.K. Rowling's Harry Potter-Novels. GRIN Verlag. p. 7. ISBN 978-3-640-16412-7. ^ Kroll, Justin (12 April 2017). "Jude Law to Play Young Dumbledore in 'Fantastic Beasts' Sequel (EXCLUSIVE)". Variety. Retrieved 12 April 2017. ^ ""Dumbledore" in Merriam–Webster". Machaut.uchicago.edu. Archived from the original on 17 October 2015. Retrieved 27 November 2011. ^ Rowling, J. K. (19 March 1999). "Barnes and Noble interview, 19 March 1999". AccioQuote!. Archived from the original on 28 February 2007. Retrieved 28 February 2007. ^ "WBUR radio interview 12 October 1999". Accio-quote.org. 12 October 1999. Retrieved 27 November 2011. ^ Solomon, Evan (Interviewer) (13 July 2000). "J.K. Rowling Interview". CBC Newsworld: Hot Type. Archived from the original on 23 April 2011. Retrieved 20 March 2011. ^ a b Mzimba, Lizo (moderator) (February 2003). "Chamber of Secrets DVD interview with Steve Kloves and J.K. Rowling". Archived from the original on 23 April 2011. Retrieved 20 March 2011. ^ Fry, Stephen (interviewer) (10 December 2005). "Living with Harry Potter". BBC Radio4. Archived from the original on 22 April 2011. Retrieved 20 March 2011. ^ Fry, Stephen (interviewer) (26 June 2003). "J.K. Rowling at the Royal Albert Hall". MSN.com. Archived from the original on 23 April 2011. Retrieved 20 March 2011. ^ Lydon, Christopher (12 October 1999). "J.K. Rowling interview transcript". The Connection (WBUR Radio). Archived from the original on 22 April 2011. Retrieved 20 March 2011. ^ a b "About the Books: transcript of J.K. Rowling's live interview on Scholastic.com". Scholastic.com. 16 October 2000. Archived from the original on 23 April 2011. Retrieved 20 March 2011. ^ Rowling, J.K,. "Wizard of the Month Archive". J.K. Rowling Official Site. Archived from the original on 2 March 2009. Retrieved 20 March 2011. ^ "Rowling dubs Dumbledore of 'Harry Potter' books as gay". Daily News. New York. 19 October 2007. Archived from the original on 21 October 2007. Retrieved 20 October 2007. ^ "JK Rowling says wizard Dumbledore is gay". Reuters. 20 October 2007. Retrieved 2 August 2008. ^ a b Rowling, Joanne Kathleen. "Chapter XII: The Mirror of Erised". Harry Potter and the Sorcerer's Stone. ^ This is mentioned in Harry Potter and the Philosopher's Stone. ^ Jeff Jensen (28 October 2005). "A Look Back". Entertainment Weekly. Retrieved 10 October 2007. ^ "Actor Richard Harris dies". BBC News. 25 October 2002. Archived from the original on 6 December 2002. Retrieved 3 March 2010. ^ Michael Hinman (29 November 2007). "No Regrets For McKellen In Turning Down Harry Potter". SyFy Portal. Archived from the original on 1 December 2007. Retrieved 30 November 2007. ^ Whitty, Stephen (15 July 2011). "'Harry Potter': The best could-have beens..." NJ.com. Retrieved 2 January 2017. ^ "Dumbledore and Sirius cast for Azkaban". Newsround. 21 February 2003. Retrieved 10 October 2007. ^ Siobhan Synnot (30 May 2004). "Olivier, Dumbledore and two broken ribs". The Scotsman. UK. Retrieved 30 November 2007. ^ Martin, Michael (12 October 2010). "Toby Regbo". interviewmagazine.com. ^ "Jude Law to Play Young Dumbledore in 'Fantastic Beasts' Sequel". The Hollywood Reporter. Retrieved 15 March 2018. ^ "Jude Law cast as Albus Dumbledore in next Fantastic Beasts film - Pottermore". Pottermore. Retrieved 15 March 2018. ^ Harry Potter's Author J. K. Rowling Meets With L.A. Students, Plots Her Next Move Retrieved on 16 April 2008. ^ Spartz, Emerson, and Melissa Anelli. "MuggleNet and The Leaky Cauldron interview Joanne Kathleen Rowling" Archived 12 June 2012 at the Wayback Machine Part 1, 16 July 2005. Retrieved on 21 October 2007. ^ Spartz, Emerson; Anelli, Melissa (16 July 2005). "MuggleNet and The Leaky Cauldron interview Joanne Kathleen Rowling: Part 3". MuggleNet. Archived from the original on 11 October 2007. Retrieved 21 October 2007. ^ "J. K. Rowling at the Edinburgh Book Festival". Accio Quote!. 15 August 2004. Archived from the original on 25 October 2007. Retrieved 21 October 2007. ^ J.K. Rowling. "J.K. Rowling Official Site". Archived from the original on 31 March 2008. ^ "Real Wizards: The Search for Harry's Ancestors". Channel4.com. 2001. Archived from the original on 18 October 2012. Retrieved 1 June 2007. ^ Evelyn M Perry. "Harry Potter and the Sorcerer's Stone Novel". Farmingham State College. Archived from the original on 24 October 2006. Retrieved 1 June 2007. ^ Sue (24 November 2007). "Gandalf vs Dumbledore: Ian McKellen Talks Wizards". The Leaky Cauldron. ^ J.K. Rowling. "Some Random Facts About The Weasley Family". J.K. Rowling Official Site. Archived from the original on 24 June 2007. Retrieved 10 July 2007. ^ Brian Linder; Phil Pirrello; Eric Goldman; Matt Fowler (14 July 2009). "Top 25 Harry Potter Characters". IGN. Archived from the original on 19 July 2009. Retrieved 3 April 2011. ^ Joe Utichi (3 November 2010). "The Top 10 Harry Potter Characters". IGN. Archived from the original on 6 November 2010. Retrieved 3 April 2011. ^ Rosenfield, Kat. "A Brief History Of The Worst 'Harry Potter And The Goblet Of Fire' Mistake Ever". MTV. Viacom. Retrieved 27 November 2015. ^ Haber, David (19 July 2005). "Dumbledore Is Not Dead!". Beyond Hogwarts. Retrieved 21 March 2011. ^ "Dumbledore 'definitely' dead, says Rowling". HPANA. 2 August 2006. Archived from the original on 8 February 2011. Retrieved 21 March 2011. ^ "Who Killed Albus Dumbledore? : What Really Happened in Harry Potter and the Half-Blood Prince? Six Expert Harry Potter Detectives Examine the Evidence". Amazon.com. Retrieved 21 March 2011. ^ "Dumbledore's outing gives text new meaning". MSNBC. 21 October 2007. Retrieved 4 August 2009. ^ Evans, Mark (30 October 2007). "Dumbledore: A Lovely Outing". Entertainment Weekly. Retrieved 21 March 2011. ^ Masters, Tim (12 November 2007). "Potter stars react to gay twist". BBC News. BBC. Retrieved 21 March 2011. ^ Rothstein, Edward (29 October 2007). "Is Dumbledore Gay? Depends on Definitions of 'Is' and 'Gay'". The New York Times. Retrieved 29 October 2007. ^ "The Life and Lies of Albus Dumbledore". East Tennessean. 22 October 2007. Archived from the original on 30 January 2010. Retrieved 21 March 2011. ^ Smith, Michelle (22 December 2014). "The 'death' of J. K. Rowling: Why it doesn't matter what she has to say about Harry Potter". The Conversation. ^ Wamsley, Laurel. "Bloggerson Stephen Colbert's presidential run". Slate Magazine. Archived from the original on 24 October 2007. ^ Thomas, Mike (22 October 2007). "So Dumbledore is Gay". Orlando Sentinel. Archived from the original on 22 May 2011. Retrieved 21 March 2011. ^ "JK Rowling outs Dumbledore as gay". BBC News. BBC. 20 October 2007. Retrieved 13 August 2016. ^ "J.K. Rowling Addresses Whether Dumbledore Will Be Openly Gay in 'Fantastic Beasts' Sequel". EW.com. Retrieved 14 March 2018. ^ "The Haw-Hawed Couple Epison Recap". tv.com. Archived from the original on 6 February 2008. Retrieved 15 July 2007. ^ "The Potter Puppet Pals". The Potter Puppet Pals Official Website. Archived from the original on 16 July 2007. Retrieved 15 July 2007. ^ "Harry Potter and the Secret Chamberpot of Azerbaijan". tv.com. Retrieved 8 July 2007. ^ "French and Saunders: Harry Potter and the Secret Chamberpot of Azerbaijan". .frenchandsaunders.com. 19 February 2003. Retrieved 8 July 2007. ^ "SNL Videos". Bill Hader Online. Retrieved 3 April 2011.